BRYAN EATON/Staff Photo. Several sections of a ship ended up next to the Pavilion at Salisbury Beach after strong waves from the weekend's storm pushed it ashore. 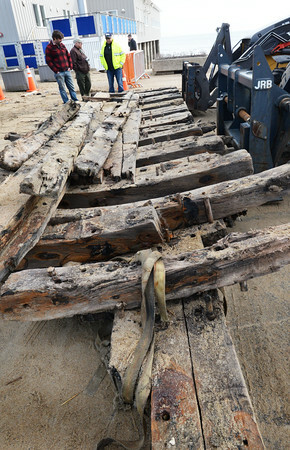 Victor Mastone, director and chief archaeologist from the state was on hand to see if it was the same ship that was seen several times up and down the beach last year.